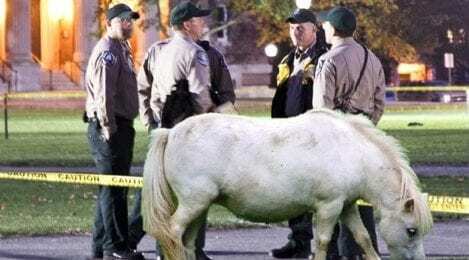 To make sure the ponies provide all the capabilities needed to keep Dartmouth’s campus safe, each animal will be equipped with the same “police interceptor” equipment package found on current S&S cruisers. This includes state-of-the-art communication systems, a spotlight, and two yellow marker lights mounted on the animal’s ears. Other local security forces may try to adapt this transportation solution for their own needs. In particular, the Hanover Police Department reports that it may consider replacing its own fleet of cruisers with a team of war elephants.